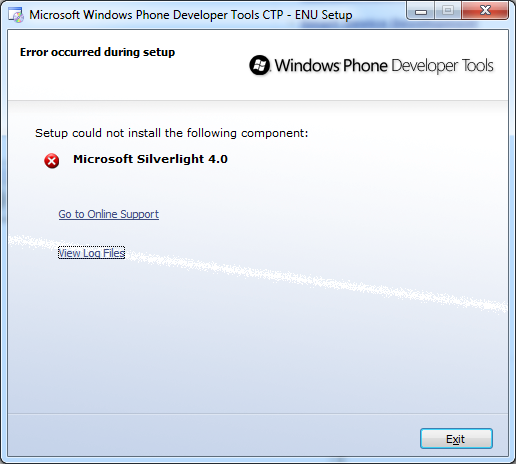 Now that Windows Phone 7 Series has been opened up a little, I was quick to download the SDK CTP. Unfortunately, I had some problems installing it (possibly caused by the recently uninstalled VS 2010 beta 2 on my machine). I had already uninstalled all things Visual Studio and .NET 4, so I snooped a little further and uninstalled all Silverlight tools and runtimes. I even tried installing the Silverlight 4 RC developer runtime manually in an attempt to get past it as a dependency of the installer. This didn't work either, hitting me with a random error number (1622) and a link to a Microsoft page reiterating the error number and an odd message about writing to a temp folder.